Step away from the boxed stuff, a quick & easy homemade version is simpler than you think. 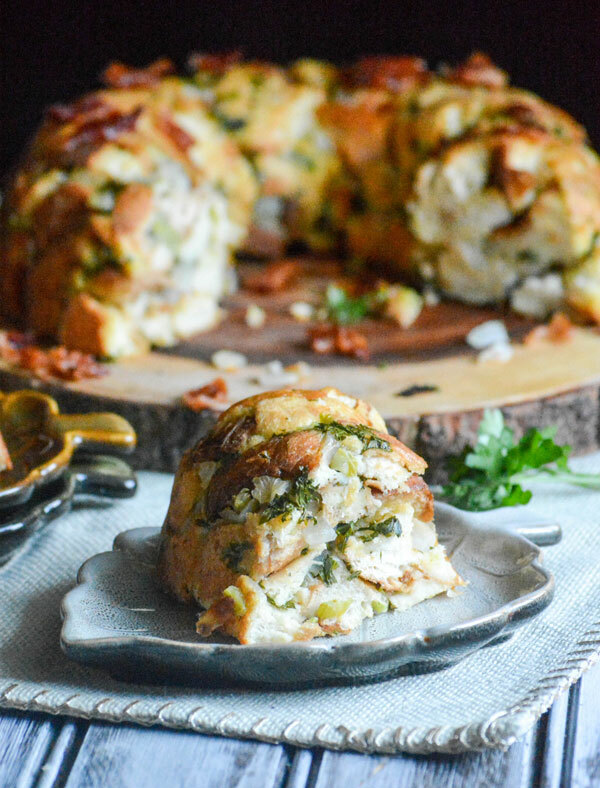 Savory Bundt Pan Stuffing takes all the classic flavors you love, adds in a little bit of bacon, and stuffs them into a buttered bundt pan. Baked to golden brown perfection, it’s turned out onto a plate, topped with more bacon, and served to the ultimate enjoyment of just about everyone. 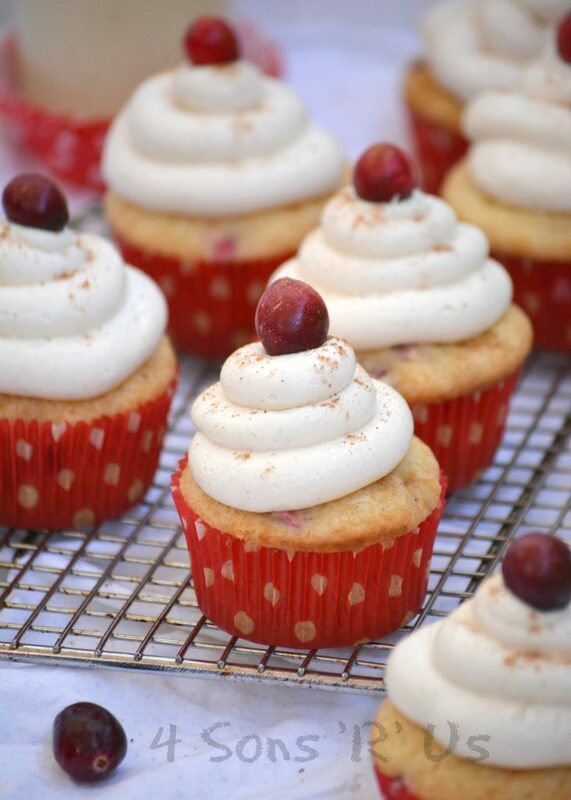 Warm, cozy cranberry eggnog flavored cupcakes are topped with a light and fluffy spiced white chocolate buttercream. With a little bit of magic in every bite– these Cranberry Eggnog Cupcakes with Spiced White Chocolate Buttercream Frosting are a perfect way to savor the season of Christmas with every bite. I’m gonna go ahead and file that under the ‘Things I Never Thought I’d Say’ tab. And in this case it’s a good thing, because it means I’ve succeeded in making adorable, edible little monsters for my little monsters. 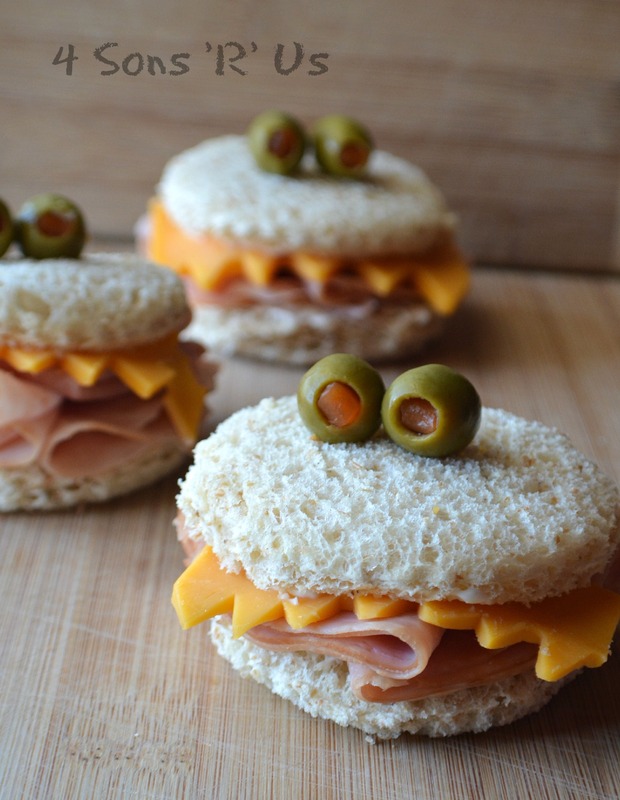 These are ready in mere minutes, making them a perfect addition to any little lunch box and easy enough to whip a batch large enough for the food table at just about any Halloween Monster Mash bash. Use a large cookie or biscuit cutter, press into the slices of bread, pulling away crust and excess to cut into circles. Use a paring knife to cut jagged little ‘teeth’ into one side of the slice of cheese. Stack the slices of lunchmeat on the bottom piece of bread & put the slice of cheese on top with the jagged edge facing ‘out’ and slightly hanging over the edge. Spread a bit of mayo and/or mustard onto the inside of the other cut piece of bread and then top the sandwich. 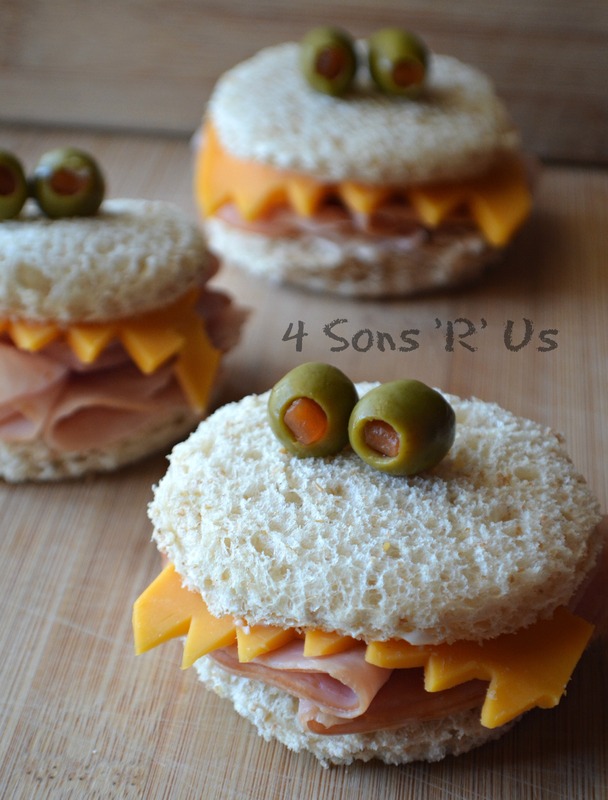 Break a toothpick in half & insert one half into a pimento stuffed olive & the other into the top of the sandwich. Repeat with the other one forming your monster eyes. Repeat as many times as needed for your desired number of sandwiches. I remember growing up and seeing all the adults drinking eggnog on Christmas Eve & Christmas day. Us kids were left at the ‘kids table’. It was a table. It was also in my grandmother’s laundry room/pantry/sewing room off of the kitchen. It didn’t bother us though. The grown-ups didn’t see us sneak a glass of the good stuff for ourselves or notice it make it’s way quickly around our little table as we each took a sip. I know what you’re thinking. Shame on you! It was non-alcoholic. Being an adult now with four boys, I totally get why they hoarded the stuff. I’m pretty stingy doling it out myself as well. To this day, my kids and I (still) love eggnog. We wait all year long for the creamy concoction to hit the store shelves again. My husband, he hates it. This cookie won him over. He was impressed. 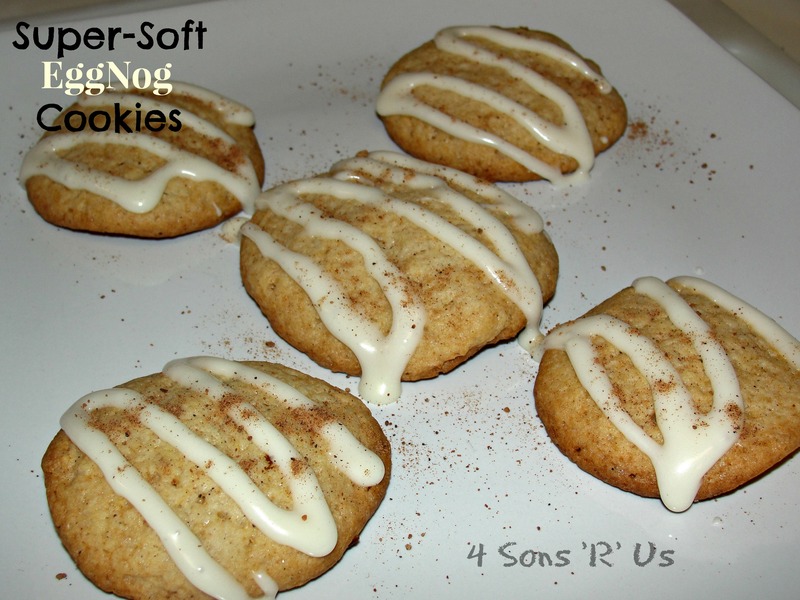 It was moist, chewy, and the eggnog taste was just right. Seriously, he ate 12. In less than 5 minutes. He may not be ready to actually drink a cold, frothy glass full but he’s behind eggnog a little bit. And that’s enough for me! For now. Before he avoided it like that little milk jug was hiding the Ebola virus in our refrigerator. As for me, and my family, we’ve seen the light. Eggnog is so much more than just the nectar of the gods a drink. 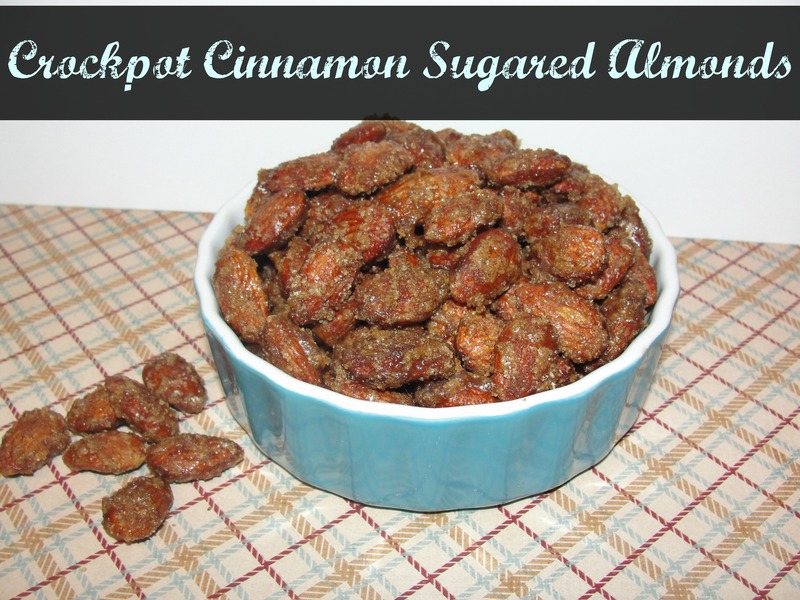 It’s an amazing, drool-worthy addition to multiple recipes. Cookies today. Tomorrow, the world! It’s time for an eggnog revolution. What do you say? 1. Preheat oven to 350°. In a medium bowl whisk together flour, baking powder, cinnamon, and nutmeg. Set aside. 2. In a large mixing bowl, cream butter and sugar together. Add egg yolks and vanilla to the mixture and beat until smooth. Finally, add eggnog and mix on medium speed until smooth and creamy. Slowly add flour mixture into the eggnog mixture and stir until combined. Chill dough for 20 minutes. 3. Line a baking sheet with parchment paper and use a cookie scoop or drop spoonfuls of dough onto the cookie sheet. Bake for 18-22 minutes or until bottoms are lightly browned. Do not over cook. Remove cookies from pan and allow to cool on a cooling rack. 4. For icing, whisk powdered sugar and eggnog together. Add more sugar or eggnog, depending on the consistency you prefer. 5. 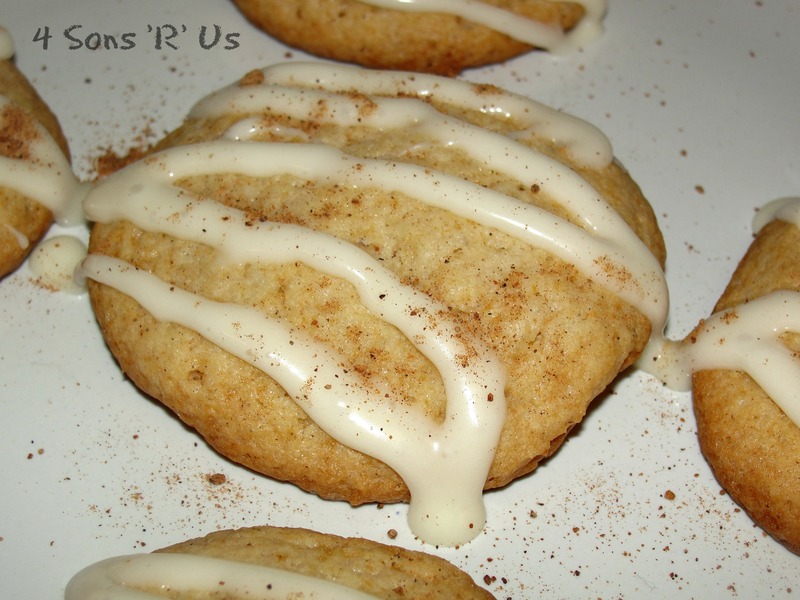 Drizzle icing on cooled cookies and sprinkle with nutmeg. Store in a air tight container in the refrigerator. According to Buddy, the elf, “The best way to spread Christmas Cheer, is singing loud for all to hear.” While I certainly believe this to be true, I can’t always just break out into song. I mean I could, but then everybody in the middle of Target would probably stare and there’s no way my kids would ever, EVER go out in public with me again. So, in the interest of self-preservation I have to reign it in. Sometimes. Like in public. Still, I absolutely love to get my family, and pretty much everyone I know, into the holiday spirit, even the little ones who still aren’t quite sure what’s going on and why Mom’s dancing around and singing about a fat man with a scratchy beard. 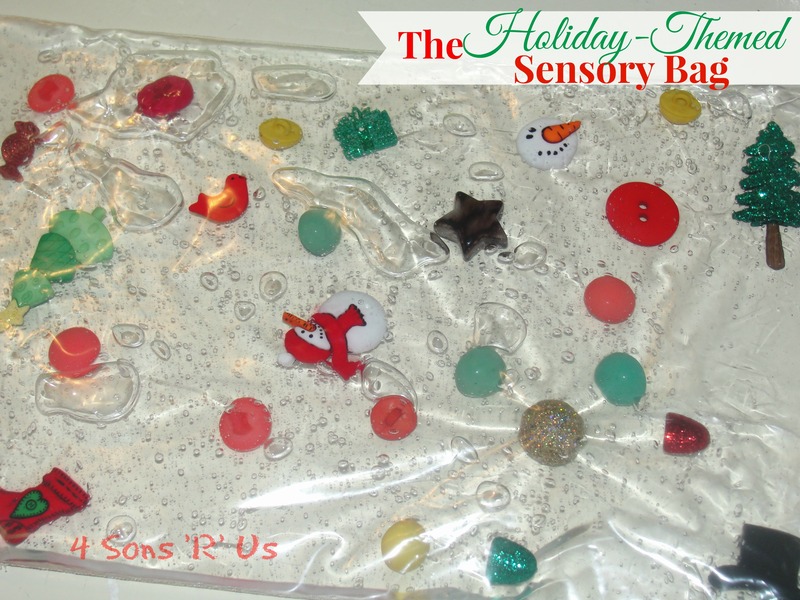 A holiday-themed sensory bag was my compromise with myself, and a favor to my kids. I mean, come on, spreading the love cheer and stimulating little minds and developing gross motor skills? That’s what I’d call winning! 1. Squirt hair gel into a zip-locking bag. 2. Add in your decorative buttons, beads, etc and zip the bag closed making sure it’s secure. 3. For extra peace of mind re-enforce the top with tape so the bag can’t accidentally open. 4. Let your little ones squish it around and explore the different pieces included. 1. Cut 6 small, ‘lumpy’ circles (you’re going for the lumps of coal look) from the black felt for the snowman’s mouth. Cut out two larger lumps for it’s eyes. 2. Glue the lumps onto the outside of your ziplocking bag to resemble a face. Let dry. 3. If using, add a little glitter to the inside of your bag. Squirt in a little shaving cream. 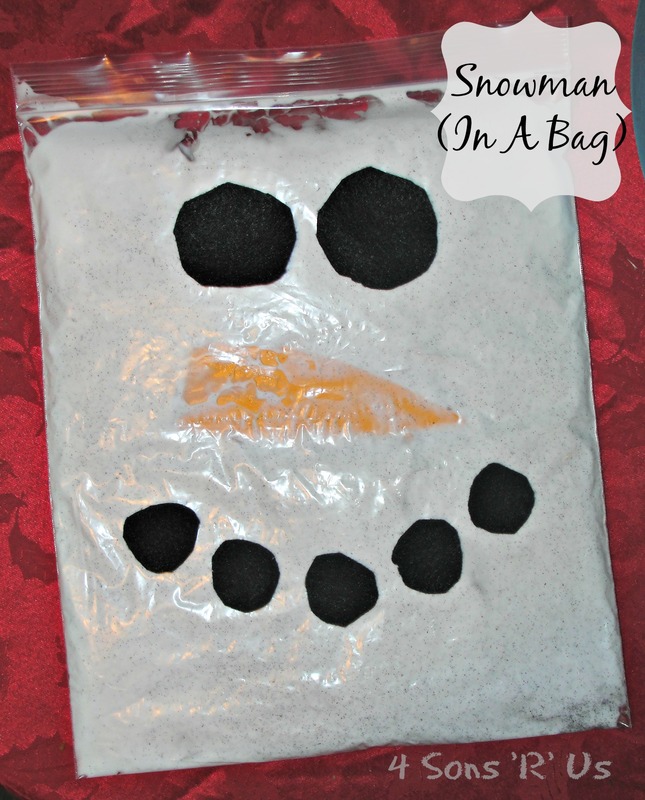 Securely seal the bag closed and squish it around to mix up the glitter and shaving cream. 4. Cut a carrot shape out of the orange foam. 5. Put the carrot shape into the bag, making sure you securely seal the bag closed again. 6. Have fun watching/helping your little ones move the nose around until they’ve completed the face. How do you spread the cheer & get your family into the Holiday Spirit?